As a Spanish Fort Realtor, I represent buyers and sellers of the beautiful neighborhood of Timbercreek. Below you're going to find extensive real estate information, what it's like to live there, and community reports. At the bottom of this page, you'll find all of the available homes that are on the market in Timbercreek. Please contact me if you need additional information or if you would like a private tour of any of these properties. 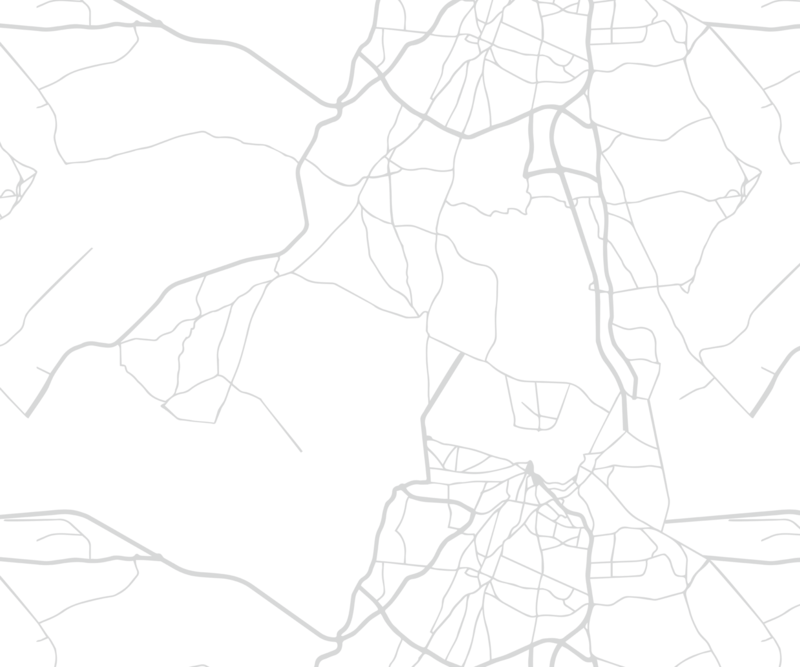 If you ask any of the locals, "What is the best neighborhood on the Eastern Shore? ", many would say Timbercreek. Timbercreek is a picturesque community that is situated near the crossroads of Hwy 181 and Interstate 10. Well, that's the main entrance. There's another entrance off of Route 31. 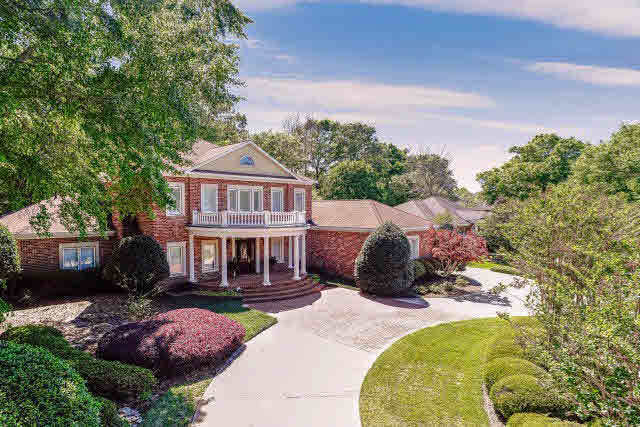 The neighborhood is well-appointed with lush landscaping and shares its space with Timbercreek Golf Club, a 27 hole championship course. Residents are afforded a high quality of life while living among neighbors who seem to have an overall appreciation of maintenance and upkeep. While there are many different types of homes, each property tends to look just as good as the one next door. Living in Timbercreek will give you easy access to major highways as well as the plethora of shops and eateries that are just minutes away. You'll read more about that later on down the page. If you want to live in Spanish Fort and you're in the market for a great neighborhood with an idyllic atmosphere, you should definitely take a hard look at Timbercreek. Timbercreek is a very large neighborhood with well over 700 home sites and actually occupies sections of both Daphne and Spanish Fort. The community was first developed in the early 90's but to this day, there are still brand new homes and lots available. Timbercreek includes properties with a wide range of styles, sizes, and price tags. House hunters could very well see homes anywhere from 1,400 square feet to nearly 7,000 square feet. Look to the bottom of this page to see the homes that are for sale right now. As you can see, the neighborhood is expansive but the community is also heavily wooded providing shade, a wind break, and gives a semblance of privacy. You'll find a balanced mix between homes with 2 stories and those that are Ranches. Although you may find a Contemporary style here or there, the main home styles in this neighborhood will be Traditional and Craftsman. With that being said, this is not a "cookie cutter" neighborhood where every home looks the same. Most are custom built with a unique look all on their own. Every time that I show a home in Timbercreek or go on a listing appointment, there always seems to be a common denominator among the properties that I visit. Homes in Timbercreek are generally well-kept and show pride of ownership. The typical property will boast manicured lawns, comfortable outdoor living spaces, granite counter tops, hardwood floors, and custom cabinetry. The lowest priced home sold for $185,000 and had 2 bedrooms with 2 full baths. The highest priced home during this period sold for $470,000, had over 4,300 square, and offered 5 bedrooms with 4 full baths. 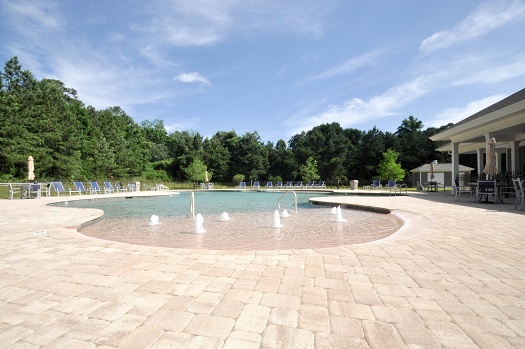 Read more details about Timbercreek Amenities here. Living in this great community will put in the direct proximity of a myriad of shopping options, restaurants, and activities. 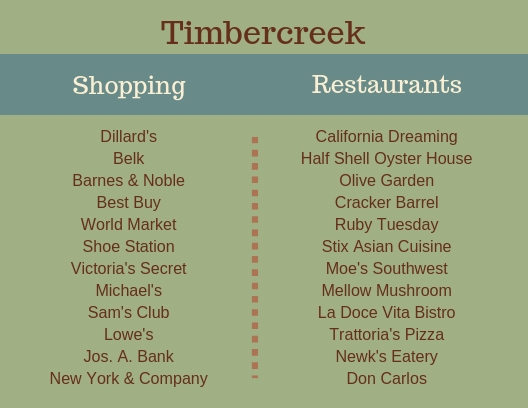 If that wasn't enough options for you, Timbercreek is also located just a few miles away from Spanish Fort Town Center which offers a Bass Pro Shop, Kohl's, JC Penny's, and more. Because the neighborhood stretches into Spanish Fort and Daphne, both school systems will apply. The good news - both public school systems are ranked high and above average according to greatschools.org. There is talk that kids from the entire neighborhood of Timbercreek will go to Spanish Fort but that isn't set in concrete yet. Besides the many activities that can keep you busy in the area, Timbercreek is a great place to run or walk. The community boasts wide streets, sidewalks, and street lamps that will provide a safe environment while you get your exercise in for the day. Here are some other things to keep you busy without leaving the area. Do You Want to Learn More About Timbercreek? I hope you found this information helpful! If you need more details about the neighborhood or any of its homes for sale please give me a call or send me an email. I sell real estate for a living and have been for about 13 years. I would love to talk with you about your real estate needs. The data relating to real estate for sale on this website comes in part from the Baldwin County Association of REALTORS. The information being provided is for consumers' personal, non-commercial use and may not be used for any purpose other than to identify prospective consumers may be interested in purchasing. Information deemed reliable but not guaranteed. Updated:19th April, 2019 5:12 PM. The Spanish Fort real estate market is flourishing and has become one of the most desirable places to live in Baldwin County. With 13 years experience working with buyers and sellers, I can't imagine doing anything else. I love what I do from helping a client purchase their very first home to working with an investor on their 20th purchase. It's exciting to go to work every day and I look forward to going to work for you.